Facebook offers a way to connect your status updates to Twitter. Sounds like a great way to kill two birds with one stone. Does “tweeting” your Facebook status actually hurt your marketing efforts? Do Facebook tweeters frustrate users and risk alienating their customers? Let me answer that question by briefly exploring the difference between Twitter and Facebook. If you already understand the basics of these two networks, feel free to skip the next section. A Facebook Fan page allows you to stay in touch with your customers and allows customers to post their thoughts and experiences about your business / product. Status updates are limited to 461 characters (at last check). Facebook also lets you post events, images, discussions, and even notes (blogs). As your customers interact with you through “likes,” comments and posts, two things occur: 1) They show up in the Home stream of your fans status updates or feeds 2) There is a central “page” that your fans can visit for all of your posts and other fan responses. Facebook is sticky, provides a connective conversation between you and your fans. As an example, www.facebook.com/drinknectar has 130 fans. These fans see my periodic posts in their feed/status update and they may occasionally click on one of my links or visit the fan page. Rarely if ever, does one of those fans actually share that information with their ‘friends.’ My reach typically ends with the 130 people. Twitter is a fast paced stream or feed of real time information. Tweets are limited to only 140 characters. When you begin to follow people you see their tweets. The people who follow you conversely see your tweets. The only way for your tweets to reach a larger audience is to get more followers or to have one of your followers re-tweet it (RT). When they do, all of their followers will see it. Twitter does not directly have the ability to host any other content except the tweet. While you do have a profile page that people visit on Twitter, it does not readily show the complete story of a tweet or conversation. Example – My www.twitter.com/nectarwine account has close to 1000 followers. When I tweet something interesting, provoking, or of value, it is very common for that tweet to be re-tweeted 5-10 times. Some of these re-tweets are by people with 50 – 15,000 followers. The potential reach of my tweet can be upwards to 30,000 people, all across the globe. Each medium has its own culture. Is one better than the other? Each has its place. Marketing and networking with the two is not always done in the same way. Here is where Facebook Tweeter goes wrong. The Issue: You are posting a link to an awesome blog, asking for feedback from your fans (i.e. your customers), or promoting a special event. For argument sake, let’s say that the status update was interesting enough for me to care enough to click it. You’ve now taken me to Facebook where I have to click something else to either be taken to your blog, see the rest of the question, or read more about the event. Asking your followers (i.e. your customers) to be interested enough to click two things in the ADD world of social networking diminishes your returns. The Issue: You have a Twitter account and you have a Facebook page. With the nature of your business, people naturally start following you on Twitter. You, however are a Facebook Tweeter that neglects your Twitter account. Occasionally, your followers (i.e. customers) mention you in a tweet, they re-tweet your cool event (because they like you), and occasionally they ask you direct questions. Because all you do is tweet from Facebook, you never see any of it. Your followers associate your lack of response with lack of care, they get disinterested and they un-follow you (take their business elsewhere). As a test this week, I asked direct questions of local businesses and event promoters who I suspected of Facebook tweeting. The result: zero response, and loss of my interest in them as a company. The Solution: Check Twitter. If using the standard Twitter page feels cumbersome (which it is), use a free product like TweetDeck to easily monitor your direct messages (DM), mentions and replies. If you are going to be on both networks, one simple rule will govern your success: Caring, observant, conversation. If fans post to your wall or comment on a post, respond to them. If followers mention, re-tweet or direct message you, respond to them. You wouldn’t ignore a customer who was standing right in front of you…would you? Do you agree? 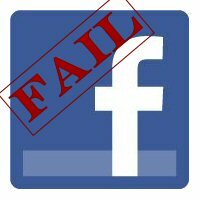 Is Facebook tweeting bad? Do you know people who are guilty of it? I am totally guilty of posting my tweets automatically on FB. I try to clean up my wall so that only the useful ones are posted, but I don’t always succeed. Yes, it absolutely DOES diminish your returns on everything posted to your wall. So why don’t I turn off this feature? Well, there are just so many people that ONLY use either twitter OR FB. I would hate to leave anyone out and I like being consistent across both social platforms. Should I come up with a better strategy… most likely! Randy, the difference is that you actually DO check twitter and I’ve never clicked a link from Twitter and gone to your FB account. Facebook tweeting is neither good nor bad, truthfully. It’s a tool, like any other. Use it poorly, and it is bad. Use it correctly, and it is good. Don’t post something to facebook that is a link to your blog, which will then get posted to twitter as a link to facebook. Do post something to twitter via facebook which will be of interest to both sets of audiences and not be annoying. John – thanks for stopping by. I agree any tool used poorly is bad. Those circular references are annoying. I like how you acknowledged the fact that both audiences are potentially different. I was guilty of it for a while, but after I started getting annoyed with having to click through a Facebook link on Twitter, I decided to stop posting my FB status to Twitter. You are right on the money about this. Facebook tweeting is hella annoying. I noticed that. You and maybe @StevePaulo are the only ones that I would ever take the effort to follow the Facebook tweet all the way to the blog. Excellent post Josh and a point hard learned. I linked my fan page to my Twitter and it took me all of 1 minute to figure out what a bad idea that was. Unfortunately, it took me nearly 15 minutes to figure out how to disconnect (I set it up through FB, who would have thought to disable through Twitter settings? Go figure). Social media works as long as we are thoughtful about what information we are trying to get out to our different audiences. Just like a company wouldn’t run the same ad they ran on TV in the newspaper—different medium, different target. I’m with you though… this is a great reminder that one can’t be lazy about marketing or it’ll bite ya from behind. I will share with now with my Twitter followers, but I probably won’t share it on my FB; sorry Josh! I’m with ‘Sip with Me’! I made the mistake and corrected it quick. It seems like a good idea, but the platforms are created to share content in completely different ways. I never recommend watering down potentially great content like this. As Randy pointed out, however, some tweets do work well as facebook posts. These ones I happily manually input onto my facebook page. I will now share this with my Twitter fans, and 1 up ‘Sip with Me’ a Facebook post of it too. Tamara – I like that, you wouldn’t run the same thing on TV as you would on Radio. Nor would you just run the same TV ad on network TV and also as a lead in to a MSNBC video or something. Each needs to be carefully crafted. SeattleWineGal – Same thing. The platforms are created to share content completely differently. You’re good at Facebook and Twitter, what would you say to these readers are some great Facebook post tips? I hate it when businesses do that. It’s annoying. Really appears lazy. Two separate social medias, with two separate types of users. Don’t lump them together. Just like MySpace is totally different than Facebook. If you don’t want to deal with both, figure out which one to use and stay only with it or you’ll alienate people. Thanks for the comment. I agree it appears lazy. It doesn’t really take much extra effort to tailor the post for both environments. I could not agree with you more Josh. This is one of my all time Twiter pet peeves. To take a stand, I have decided NEVER to retweet a post that links back to someone’s facebook post. Harsh? Maybe, but we all have to stand for something. I don’t really get frustrated with businesses that do this because, like Josh said, I just move along to the next one that will take the 30 seconds to respond to me. When first using social networking syndication tools, make sure to use ones that are effective, such as ping.fm. Don’t use the standard built-in Facebook & Twitter tools. There is much more functionality with ping.fm so you can pick if you want to post a micro message (under 140 characters), video, photo, exc. You can also select the specific networks you would like to post it to. Like Josh, I use TweetDeck. For managing responses on your networks such as Facebook and Twitter, it works great! Facebook tweets are very annoying. I saw a tweet in my stream yesterday that suggested I follow them on Twitter. That, is hilarious and sad at the same time. Great chatting with you last night! Thanks for the comment. But let me get back on topic… having said that, I certainly can understand making it as easy as possible for your audience to get to content and an extra click might prove annoying. And I certainly do not alienate Twitter vs. FB or vice versa. Yet, does the data (is there data other than folks responding to this thread?) prove that both channels have to be mutually exclusive? If I follow this sentiment, then it makes no sense to ever turn on the auto-link features amongst the social media sites… no? Really, with all the spam, hacks and other things subjecting us to possible invalid twitter suspension, is this what we should “take a stand” on? I’m definitely not as militant about NOT clicking through on FB links as some of the commenters are, but the point is there is a diminishing return on click through (even if just based on the comments, but now I am challenged to find actual data). The greater problem is the potential alienation of customers by never checking your twitter stream for responses. If you’re going to Tweet your FB status, at the very least you should occasionally get on Twitter and check the @replies and DMs. Wouldn’t you agree? P.S. Thanks for your comment and thoughts – always a pleasure to have you here. Yes, I can’t stand clicking on a link only to be led to a Facebook page with no photo or additional content. I wish business would stop doing that, it actually makes me not want to go to their business. It can be very anti productive for these businesses. How can we spread the word, so they realize they are experiencing diminishing returns? Josh, just wanted to say hi, and that I really like the way you mix up the wine tasting with the wine marketing stuff. Thanks, Ron! I appreciate the kind words and feedback! I do not do it the otherway posting Facebook updates to Twitter as I have never ever clicked through a tweet and followed through to Facebook – I hate it and do not do it no matter how interested I am in the description that got me there. Also I just launched a Facebook Fan page this week so perhaps my thoughts on how to use the 2 will change going forward. As of now though my personal Facebook page is were my Twitter updates go. Thanks for the comment! I love your site http://kahunasfoodandwine.com/ HUGE LASAGNA FAN! I hope that through this and other efforts I can educate some businesses about the perils of FB tweeting. I was looking for your fan page…what is the address? I’m not much of a fan connecting my status updates to Twitter. Rarely, I might post a relative tweet in both applications but I don’t have it set up to automatically do it. I have so say that one of my nits (which is quite annoying) is clicking on a URL from twitter only to be directed to Facebook with the exact same message. If I click on the link, I expect to see more content, whether it’s a picture, more descriptive info, etc. I completely agree, Pamela! Maybe after all of these comments, people will start to get the idea that it is doing a disservice. I missed this when it was first posted, but it definitely outlines exactly how I feel when I have to click through a FB status from a tweet. Diminishing returns is exactly the result of this tomfoolery, and though I was a diligent clicker-through when I first got into Twitter, now that I follow 500+ people and have several tabs perpetually open, that extra effort might mean a nixed reading opportunity. Great point, if you want response, make it easy and short. People have a short attention span and move on quickly. Chateau Morrisette has had a Facebook page for quite a while, and when I opened our Twitter account, I linked them together, thinking this was a good idea. Not so, as I learned during #cabernetday at the beginning of the month. Twitter is an ideal platform for rapid-fire messages and real-time interactions. Facebook is not. Many FB fans were upset by the amount of posts that were automatically placed on our page from our Twitter site, as we were posting every minute or so during a real-time tasting. I quickly unlinked the two, and that has worked much better. Now, the only time I post a FB link on Twitter is if it takes the follower to a photo album, note, or discussion. It might take a little more time to post on each place, but since the platforms are quite different and our fans/followers seem to be focused on different things, it is worth it.